Now, and in the past, migration has provided millions with an escape route from poverty, oppression, and conflict of all kinds. 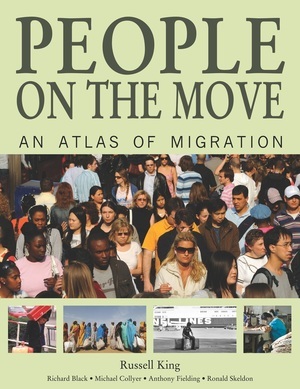 Through full-color maps, graphs, and photographs, People on the Move distills a vast amount of information as it explores the ways in which humans have spread around the world, adapted to new realities, and shaped their destinations. From the history of migration to contemporary global patterns, this concise atlas illuminates a wide range of topics in a crisp, accessible text—including refugees and asylum seekers, diasporas, remittances, the brain drain, trafficking, students, retirement, return migration, and much more. Full-color maps of regions, countries, and continents vividly display trends, issues, and processes at a glance, giving a richly detailed picture of human mobility. Russell King is Co-Director of the Sussex Centre for Migration Research and Professor of the Geography Department at the University of Sussex. His previous books include Mass Migration in Europe, and The History of Human Migration.